Now you have been inspired, you will be ready to get down to the real work. First step, as always, is the soil preparation. Loosen the soil, and if necessary double dig it, till it's 'friable', which is to say it can fall through your fingers. Then spread some all purpose fertiliser evenly over the areas to be planted, as per the instructions on the packet. Lots of people think the more fertiliser they spread the better, but it's best to stick to what's described. Once you've turned the fertiliser into the soil, you're ready to start planting. If you're a beginner, or like me just impatient, start your herb garden off with plug plants. You can always save some seeds at the end of the year to resow if you want to. 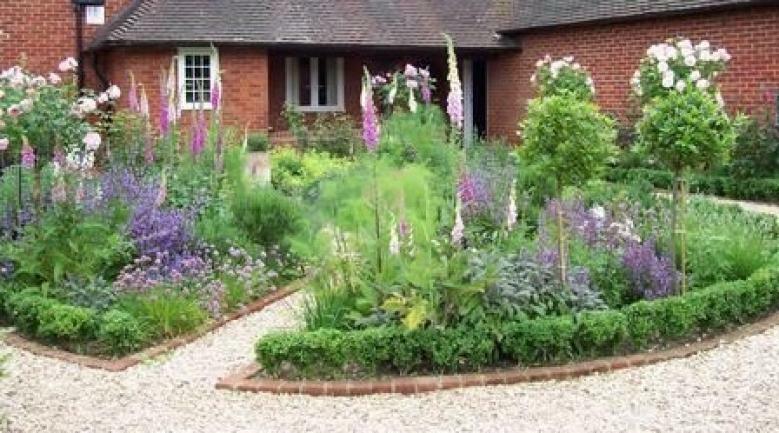 For the first year or two it's best, about halfway through the season, to spread a second batch of fertiliser in mini trenches around the edges of the plants, which will encourage more growth. Then recover the mini trenches with the soil, remember to water it all in, and sit back and enjoy the fruits of your labour! For maintenance purposes you can divide herbs roughly into two types, the ones grown for their foliage, such as mint, chives and lovage, and the woody ones, such as rosemary, lavender and thyme. For the foliage types you can cut them back quite a lot after flowering, to encourage lots more leaves, but the woody types just need to be pruned and shaped in the Autumn. Bay leaves are used in many recipes, and bay trees make a strong, evergreen focal point in a herb garden. If you want to shape them, or maintain the ball of a standard bay tree, do this in Spring once all chance of frost has passed. Many herbs have wonderful seed heads, and even if you like to collect the seeds, remember to leave some of the seed heads, so you can enjoy them in the winter months when they glisten in the frost. Angelica and Fennel have some of the best seed heads for this. Like all plants, herbs will be affected by some pests, but for both ecological and culinary reasons, try not to use pesticides. The rosemary beetle (Chrysoline Americana) is becoming a real pest in Britain. It comes from Southern Europe and lays it's eggs on rosemary and lavender mainly, though has been known to favour sage and thyme as well. These beetles are shiny and jewel-like and lay their eggs on the undersides of the leaves. To get rid of them you can either pick them off the leaves with your fingers or, whilst holding a sheet of paper in one hand, you can shake them off the stem of the plant, on to the paper, and then kill them. A garden is a grand teacher, it teaches patience and careful watchfulness, it teaches industry and thrift; above all it teaches entire trust.